China pair Feng Shanshan and Ye Li Ying topped the lead in both the individual and team events after the second round of the World Ladies Championship at Mission Hills Haikou in southern China on Saturday. Ye shot a 67 and Feng a 69 to leave the two players in a share of the lead on nine under par. Those rounds took China clear at the top of the team standings, lifting them on to 18 under par, eight shots clear of Thailand in second. 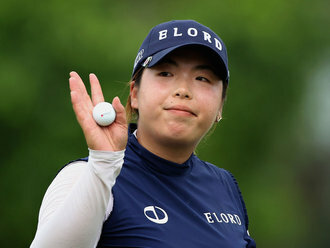 "I usually have a habit that I don’t really look at the score board during the tournament but this time I was actually watching because I wanted to see how we are doing and it was really a surprise," said Feng. "I was really happy when I saw both of us were on top and our team score was on top too. We are partners and I think if either of us wins, I will feel really happy." England’s pair of Florentyna Parker and Melissa Reid were fourth in the team standings, 11 shots off the pace. Parker was in a tie for third in the individual event, a 68 putting her seven under and level with Thailand’s Pornanong Phatlum and Italy’s Diana Luna. Reid was in a tie for 27th on level par.